To be saved, abandon hope. Is it a biscuit? Or is it a bar? Does the convergence of a range of environmental, energy and resource crises compound a problem – or a predicament? The question is neither trite nor trivial. For the last several decades, environmentalists and scientists alike have attempted to frame our ever-intensifying ecological crises in terms of problems that, through a combination of better technology and increased efficiency, could be managed successfully. Hence the oxymoronic ‘green growth’ and ‘sustainable development’. Self-help books along the lines of 50 ways to save the planet sell alongside volumes on everything from homeopathy and astrology. As long as we define our existential crux in terms of a series of problems that can be managed, this is a perfectly rational approach. In a crisis, being able to distinguish between a problem and a predicament can mean the difference between life and death. In simple terms, problems have solutions, predicaments have outcomes. The sinking of the Costa Concordia in January is a case in point. The failure of the captain and senior crew to recognise their predicament (i.e. this ship has a giant hole in it) led to fatal delays in evacuating the vessel. Time that might have been spent getting people to safety was instead frittered away in fruitless discussions between the ship’s crew and its owners. Given the botched evacuation, had this disaster happened further from the shore, the death toll could have run into thousands. All of which brings us to where we now find ourselves. Unsurprisingly, the world has arrived at precisely the position projected by scientists as far back as the late 1950s, and now realised beyond any reasonable doubt: Earth is being rapidly forced into a new, hotter, state. A massive energy imbalance has been accumulating for decades, like a giant rubber band being stretched ever further. System inertia means that, in the shorter terms, these effects are dampened. At a certain point, however, the system either snaps entirely or recoils with a wallop. When that precise moment will occur is impossible to predict; that it will occur is a mathematical certainty. the scale of meteor impacts have so profoundly altered the composition of the atmosphere in such a short time. These CO2 levels are now higher than at any time in at least the last three million years, and the needle is climbing fast. On the other hand, the freight train that is industrial civilisation needs to run at ever-increasing speeds, burning ever more resources and spewing out ever more pollution – simply to stave off economic collapse. That’s the predicament. All the wishful green thinking and lightbulb-changing in the world counts for naught when set against these realities. 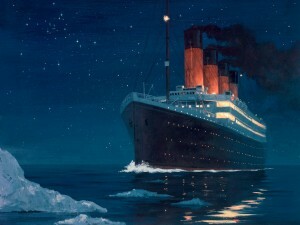 April marks the centenary of another famous sinking, that of RMS ‘Titanic’ in 1912. It remains a potent metaphor for hubris and nemesis, and an apposite reminder of the hazards of melting ice. In that disaster, to save lives, passengers and crew alike had first to accept the painful fact of their predicament, and then abandon ship. To save lives, we must first kill hope, for hope is the mortal enemy of resolve, holding out the chimera of easy fixes to our fathomless predicament. The battle to ‘save the environment’ has ended. The long campaign to save our own skins has now begun in earnest.